Hailing from the suburbs of Chicago, IL, Marie traded flatlands for flannel when she moved to Maine in 2012 to study at the University of Maine; there she earned a B.S. 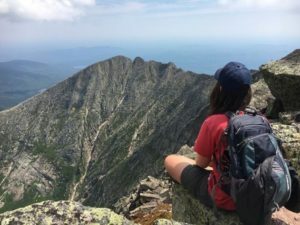 in Wildlife Ecology and fostered her love of blueberries, solitude, and the natural world, and completed a senior project evaluating ruffed grouse (Bonasa umbellus) survey methods in the state of Maine using occupancy analysis. Her experiences span many taxa (insects, fish, birds, mammals) and locations (including Illinois, Maine, Mississippi, and Wyoming) and she is generally interested in population ecology and wildlife-habitat relationships. She is particularly interested in the effects of management on demographic processes, and individual movements and behavior. Since 2015, Marie has been working as a research fellow on a Pacific marten (Martes caurina) rest and den structure assessment in Lassen National Forest, CA. When Marie is not chasing martens, tagging remote camera photos, or struggling with R code, she enjoys a variety of activities including mountain biking, backpacking, being mediocre at winter sports, searching for wildflowers, and playing with other people’s dogs. Her sedentary pursuits include drawing, reading, and knitting. Her favorite cheese is sharp white cheddar.